Potions are ubiquitous – they are everywhere. The word ‘potion’ is derived from the Greek word ‘poton’ which means ‘that which one drinks.’ So, in theory, it can be anything you drink, from an energy drink, or beer, or a medicine or even poison. But we are concerned with the original potions which still work as well as they ever did. These potions are the ones charged with energy, or magick if you will. The Craft and alchemy commonly use potions; in fact they are a basic part of each. Potions – What Are They Used For? Apart from drinking, potions can be used to sprinkle an area, to add to a ritual bath, to anoint and to add or absorb energy. The ingredients used for some of these purposes make it very inadvisable to actually drink the potion. Obviously, the making and use of potions also draws heavily on the alchemy and herbalism disciplines. In fact, at one time Herbalists were also Alchemists as an integral part of their occupation and potions were an integral part of that. Other knowledge or disciplines are also necessary for the successful manufacture of potions. A knowledge of alchemy, astrology, of lunar phases, the use of oils, incenses, and lunar phases, to name just a few, are also required for your potions. Consider what you have just read – to successfully manufacture working potions you need to know the correct herbs to use, when to pick them, and sometimes where to pick them. Have you tried extracting the essence of the plant or flower or herb etc? There are a lot of ways to do this supposedly simple thing and not all of them will work. Thus you have to be precise and knowledgeable in making your potions. Potions can be strengthened - do you know how to do this? You will also need to know how to amplify the efficacy of your potions and how and when to apply your willpower to the making of your potions? Some potions require you to do the right amount or rotations when you are stirring them. Do you know this number, or even which direction you stir it? And what temperature should your potions be at during the various stages of manufacture? Occasionally it is necessary to chant while making potions? Chants are sometimes essential, sometimes not. But even if not essential they can sometimes increase the power of potions. Water is commonly used in the vast majority of potions, but what type of water? Did you realise there are different types? Tap water will not do for these purposes, so you need to obtain some ‘effective’ water for your potions. Some contain alcohol, which type? and various other elements, what are they, how do they work together with the other ingredients? As you can see, making effective potions involves a lot of diverse disciplines and the ability for effective planning. Some ingredients and potions have a limited shelf life, which you must know and take into account in your planning. Intent and willpower are also critical for the successful manufacture of potions and these talents need to be developed and practised in order to be successful. A knowledge of the appropriate recipes is also critical. Simply throwing a few ingredients together to a recipe you obtained free from the internet just will not do if you want effective potions, well unless you are very lucky, that is. The qualities of all the ingredients of your potions are cumulatively responsible for your success. And when I say ingredients I mean the chemicals, elements, herbs, spices, stones, minerals, hair, willpower, timing and storage – in fact, absolutely everything used to produce your potions. Even if you get that correct, sometimes your potions have to be drunk at a certain time, or within a certain time scale. All this assumes you can obtain the ingredients for your particular potions. And yes, you probably can because potions, at least the basic ones, were and are designed to use the ingredients at hand. But some potions require esoteric ingredients and you may well have difficulty in obtaining them. In addition you also need to really trust your supplier and manufacturer because ingredients for potions are delicate and need to be harvested and prepared and stored properly. I hope you now realise the plants and herbs and flowers have, at the very least, to be organic. If not, the additional pesticides and fungicides will affect the power and efficacy of your potions for the worse. Potions derive part of their efficacy from the interactions of the ingredients, so, knowing this you will appreciate they need to be as pure as possible. The best way to ensure this is to harvest and obtain the ingredients for your potions yourself at the appropriate times. Now, have you considered how you’re going to store your ingredients and finished potions? You really don’t want any ‘stuff’ from the storage vessel leaching into your work, do you? Stoneware and glass containers are good, plastic is bad. And remember, light can also leach in, so add coloured glass to your storage vessels as well. Light can be an ingredient for some potions, so in these cases you will need to use clear glass. The intention of this article is not to put you off making your own potions. It is possible, and with a bit of experience, easy, to make them at home. Once you have the basics off, you will realise why certain ingredients go into your potion. With this knowledge, you will be able to confidently alter ingredients to suit your own circumstances without altering its efficacy. Also, you will be able to properly design and develop your own potions. So what can you actually use potions for? Well just about anything, really. 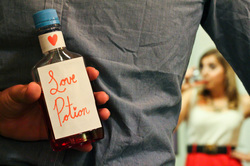 Try the ubiquitous love potion, and the related lust potion. Are you unemployed or want another job? Consider the employment potion. I’ll finish off this article with a free potion for you. It’s in the public domain and easy to find, once you know where to look, that is. Scene - A dark cave in the middle of which a Cauldron is boiling. There is thunder sounding. Actually, on second thoughts, perhaps this is one of the potions you should not try at home.